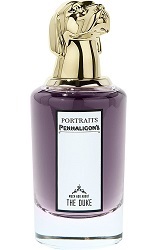 The Penhaligon’s Portraits Chapter 1 collection includes two perfumes for women and two for men. Today I'm reviewing the men's offerings: The Tragedy of Lord George and Much Ado About the Duke. I dutifully sniff any Penhaligon's perfumes that come my way (I never go to any trouble to seek them out); I don't feel excitement when the company announces a new perfume because, with a few exceptions (and no matter the perfumer) Penhaligon's perfumes lack pizazz and many recent Penhaligon's releases are downright wishy-washy in character. And now we have an "aristocracy" collection, or chapter. Perfumer: Alberto Morillas; listed notes of ambergris (Ambrox), fougère accord, brandy (or rum, depending on the info source), shaving soap and tonka bean. Masculine and elegant – with a hint of rum. Powerful, rich and ever so welcoming — “do come in, I’m sure we’ve met before.” For the well-to-do who are able, stable, reassuring — but also lots of fun. A solid shoulder to cry on (was that a protective hand I felt on my _____?) This is a fragrance for the man whose reputation lives on. Not quite Latin — but full of love nevertheless. The Tragedy of Lord George goes on smelling boozy, like a smooth, "green" amber-scented brandy cocktail served with a splash of tonka bean syrup. Quickly, the amber-tonka combo takes over and it's combined with a touch of fresh, peppy wood (guaiac?) The Tragedy of Lord George has a comforting/cozy vibe that's perfect for autumn; I like it. But then there's the "luxury" price — for a perfume that does not smell luxurious at all. Unless you love the bottle and MUST have it, you can have a richer, and more interesting, tonka/vanilla-amber experience with Laura Tonnato Amir (100 ml Eau de Parfum, €80) or Speziali Fiorentini Profumo al Tè Nero (50 ml, €20) or any number of woody-amber-tonka bean fragrances. The Tragedy of Lord George is its inflated price and lack of daring; its sillage and tenacity are good (dear ole Ambrox lasted through a hot shower). Perfumer: Daphné Bugey; listed notes of pepper, rose, gin, cumin and leather. Much Ado About the Duke presents an "India"-spiced pepper, cumin and citrus opening, on the sheer side but with distinct body odor scent. Much Ado About the Duke places its bright, light-scented tea rose beneath a heaping helping of spices, but within 15 minutes of application, Much Ado About the Duke has an aroma I'll call "lingering rose scent on a dirty shirt" — a combo of sweat and "tired" soapy rose. I have a hard time with soapy florals, so Much Ado About the Duke's rose was not a hit with me, even with added cumin; as I wore the perfume (as with The Tragedy of Lord George), better perfumes came to mind: Atelier Cologne Philtre Ceylan (also sold at a crazy price, $250 for 100 ml or $130 for 30 ml) and Eau d'Hermès (100 ml, $134); both these perfumes have the guts to go "all the way" with leather and cumin.The Duke has good sillage (too good) and all-day lasting power: though I scrubbed and scrubbed, I could not dislodge its artificial molecules from my arms and chest. The Tragedy of Lord George and Much Ado About the Duke have animal-head bottle caps and these animals supposedly represent the personalities of the lord and duke (ho-hum fellas with no connection to stags or dogs, unless there's some "hunt" suggestion). What am I saying? None of the PR makes sense! The shiny bottle caps look cheap to me and I wonder why someone didn't suggest a matte or verdigris finish, "bronze" or faux stone instead. Penhaligon's Portraits Chapter 1 The Tragedy of Lord George and Much Ado About the Duke are available in 75 ml Eau de Parfum, £178. For buying information, see the listing for Penhaligon’s under Perfume Houses. Soooo not much to say or do about the tragedy of the existence of these two…Lol.I love the UK brands like Lush/Gorilla,Union…Penhaligons-pedigree and Royal warrants and all-just never appealed to me as a brand.Maybe their perfumers need a good night out at the pub to really “get” those boozy notes to work. Johanob…may be! But apparently these are selling! Yep, I feel the same way. I love Vaara, as a summer perfume, but it is so very clearly the discount version of Mohur, at the price that Mohur should have been all along. my feeling about Penhaligon, Vaara, ANN Mohr exactly. Geordie…my only fave is Hammam Bouquet…but am afraid to try the current version. I am enjoying your blunt comments about these fragrances, which do come off as very strange in their press copy. (Are they trying to be a bit Smell-Bent and failing miserably?) The caps are rather hideous and just not good at any price. It’s a shame they aren’t making up for bad packaging with knock-out scents. I am glad to hear you say: None of the PR makes sense! R, GLAD when you chime in! I haven’t been moved to own a single Penhaligon’s, though Lothair came close. I rather liked the goofy caps, in photos at least. Anyway, they seem to at least fit the Monty Python theme in the SOTD posts today. Elisa, the caps look so ‘Avon’ to me in photos…wonder if they are heavy? For an English brand they certainly know how to mangle the English language, it’s sound like it’s been through a translator program then translated back into English again. If they had gone for the MDCI matte bust look it could have worked, and the idea of the verdigris cap like old stone garden statues is great! Have never found anything amazing in penhaligons, especially given the prices, they trade on their heritage in the PR but the follow through is always half hearted and muddled – who wants an old English brand with a heritage themed collection with tacky gold plastic caps?! They make Roja Doves jewelled bottle tops look classy ! Nathan, ha! And to make the Roja bottles look good in comparison is a hard task. ‘Half hearted’ is a good way to describe these. I swear, somebody’s going to hurt themselves on Lord George’s cap! 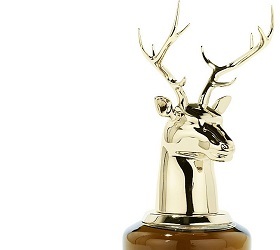 Kyril…I would be the first to poke an eyeball…would have to cover those antlers in cotton balls! Please,if someone buys that one I want to see a pic of antlers covered in big fluffy red pompoms ready for Christmas decor! I’ve heard The Duke is a clone of Rose 31 by Le Labo done by the same perfumer. Your description also confirms that. Do you really notice the similarity? Antonpan, yes, they are similar, but I’d pick the Le Labo over this one. No doubt these are aimed at tourist consumers from cultures with, err, different aesthetic sensibilities. I cherished Pehaligon’s for its heritage or heritage-style perfumes: Hammam Bouquet (finally ruined for good now), Blenheim, Racquets, Castile, but their corporate owners have focused on quirky Englishness as a marketing ploy while abolishing any kind of distinctiveness in the fragrance portfolio. Plus, it’s frustrating to see how a decent perfumer like Daphne Bugey has to churn out an entire new line for L’Artisan and these Penhaligon’s shenanigans all at once – how can they not be boring recycling exercises (and let’s not even speak of alloted raw materials budgets)? DofPM…guess I’ll have to find an old bottle of Hammam Bouquet then! The hunt starts…. Oh Kevin, you’re so right! People who know me from this site will be aware I am a longtime Bluebell user – I think their last decent fragrance was Ostara, which was only with us for a short time, much to my dismay as I’d made a convert of my best friend to it, despite her protesting for years that their fragrances were ‘too floral’. Ostara is much missed, apparently, if a recent conversation with two very knowledgeable (& charmingly indiscreet!) sales ladies in one of their very high-end locations in London is anything to go by. Kevin, I can always count on your reviews to make me smile! I had the opportunity to hear the “story” from a lovely and knowledgeable Penhaligon sales person. He walked me through the story and logic behind the notes in each of the perfumes. It was kitschy and entertaining. I liked the bottle tops. In the darker setting of this Penhaligon shop, they weren’t garish. But in bright or fluorescent light, maybe so. My personal favorite was The Duke. But I enjoy a smidge of cumin every once in a while!???? Laura: glad the Duke has a fan. I like cumin as well…just not in a “soapy” setting. HA!